Ndihma Ekonomike (NE), the largest social assistance program in Albania, is currently targeted through a two-stage process, combining geographical targeting with individual targeting at the local level. The program’s performance is relatively good, though recent analysis shows how the categorical filters applied to household selection restrict the coverage to a minority of poor households. Further, anecdotal evidence and focus group analysis shows that the application of the current eligibility criteria can be nontransparent and administratively cumbersome. This chapter exploits the availability of a detailed information from the 2008 LSMS and an updated poverty map (Betti et al. Updating poverty maps between censuses: A case study of Albania. In Ruggeri Laderchi and Savastano (eds). 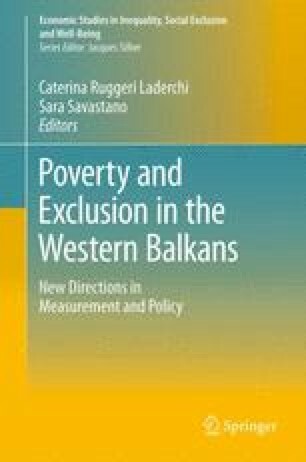 Poverty and exclusion in the Western Balkans – new directions in measurement and policy. Springer, 2012) to simulate budget-neutral improvements that could increase the coverage and the targeting performance of the program. The findings show that significant improvements in coverage of the bottom quintile could already be obtained by strengthening the link between municipal level allocations and poverty through a naïve poverty share approach (Elbers et al. Poverty alleviation through geographic targeting: how much does disaggregation help?, 2004). This chapter also presents a statistically derived proxy means testing measure. Adopting this indicator to screen beneficiaries could result in an improvement of the share of the benefits going to the bottom decile by more than 40 percentage points and could allow an increase by 33 percentage points of the coverage of this target group. The findings, interpretations, and conclusions expressed in this chapter are those of the authors and do not necessarily reflect the views of the International Bank for Reconstruction and Development/the World Bank and its affiliated organizations or those of the executive directors of the World Bank or the governments they represent. The World Bank does not guarantee the accuracy of the data included in this chapter. Following the literature, a PMT was constructed by regressing the natural logarithm of per capita expenditures on a set of household characteristics. Rather than forcing model parameters to be equal for the entire sample, we allow for different slopes across strata and urban/rural areas. Note that PMT models commonly include location variables (such as geographic stratum or urban/rural variables), which would allow for different intercepts across groups defined by these variables, whereas estimating separate regressions for the above subregions allows for a less restrictive specification. These estimates were used to predict expenditures for households with observed characteristics. As the basic idea behind PMT is to rely on household characteristics as proxies for income, household welfare relevant characteristics were chosen, trying to ensure that they respected the principles identified in the literature (Coady et al. 2004): high correlation with poverty; parsimony, in order to ensure feasibility of implementation for a large share of the population; observability and ease of measurement; and difficulty of manipulation by the household. In selecting the variables to be included in the consumption regressions, we follow Grosh and Baker (1995) and choose variables from three broad categories (1) household composition characteristics, (2) housing/dwelling characteristics, and (3) ownership of assets. The LSMS provides a number of housing characteristics that could be included in the set of explanatory variables. The important consideration here is that characteristics that are chosen are easily observable and/or measurable. For instance, one of the questions in the survey asks whether the condition of the dwelling unit is very good, appropriate, or inappropriate for living. While this variable can be shown to be a strong predictor of welfare, Coady et al. (2004) note that chosen characteristics should be such that different staff members or the same staff member on a different day or in a different mood would make the same evaluation. It is unclear whether including a variable of this kind could potentially result in manipulation; hence, we do not include this variable among housing characteristics. The chosen variables include the type of dwelling (whether residing in an apartment building or not); type of dwelling ownership (whether owned by HH or not), whether the household is connected to the public water supply system; type of heating used; distance to nearest hospital; as well as whether the dwelling has any of the following: kitchen, garage, terrace, or pantry. The distance to the nearest hospital is also included as a measure of access to health services. A number of assets that have been previously used in PMT analysis are chosen, including the following: color TV, refrigerator, computer, car, motorcycle, video/DVD system, washing machine, dishwasher, air conditioner, water boiler, TV cable/satellite dish, wood stove, and gas/electric stove. Whether a household owns a phone is not included since only a fixed phone is observed in the survey, and lack of a phone could certainly be due to reliance on cellular phones, but we cannot distinguish between this situation, and lack of any phone in HH. The main findings of the models are described in Table 16.3, which presents the signs of the coefficients significant at more than 10%. Following Hentschel et al. (2000), a further test of the accuracy of the PMT model was performed by randomly dividing the survey sample in half and estimating the same models as above for one half of the sample. The estimates from these regressions are then used for an out-of-sample prediction for the remaining half of the survey data. As sample sizes were too small to reestimate over rural/urban regional subsample, overall regressions were estimated with dummies for each of the subregion (coastal urban, coastal rural, etc.) to allow for differences in intercepts. The fit of the regression was quite good, with an adjusted R 2 of 0.57. The sign of the coefficients in the model was generally similar to those of estimates from subregional regressions. Furthermore, based on the half of the sample over which the model was estimated, the correspondence of distribution quintiles is only marginally lower than in the case of subregional regressions—60% of those in the bottom quintile of the distribution of actual expenditures are also in the bottom quintile of the distribution of predicted expenditures and vice versa. As could be expected, the out-of-sample prediction was not as good with the correspondence between the bottom quintiles of actual and predicted distributions being only 55%. Nevertheless, the leakage and undercoverage rates are still comparable to those reported above.